And another fall recipe this week... This month of October is full of them for the TWD-community with the Double Apple Bundt Cake last week and the Caramel Pumpkin Pie (can't imagine this one - sounds, uhm, special...) and the All-American, All-Delicous Apple Pie to come the weeks to follow. But let's talk about this week. 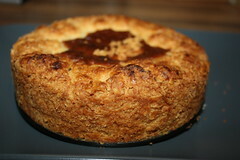 Cakelaw of Laws of the Kitchen selected the Fold-Over Pear Torte. 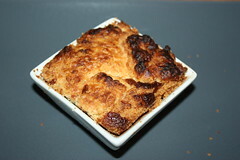 Go to her page to have a look at the recipe, if you don't own Dorie's book (pages 348 and 349). But I recommend to have a look at her page anyways, because she is one of the few non-American-TWD'ers and I always find it very interesting how non-Americans find their way to TWD, and what they choose. I think they often choose the most typical-american of all, funnily. And (more important) - she is very supportive, always kind, leaves a lot of hints, tricks and comments and bakes wonderful treats. I like pears and fall recipes, and I extremely like this Torte. Even though I think of it more as a pie than a torte, but maybe that's a language problem. The dough is wonderful. I could eat tons of it even without filling. But why should I, when I have additionally this tasty pear-filling? I think your torte turned out fantastic - yours looks just like mine, which is comforting, as I had no real idea of how this was supposed to look. Thanks for the kind words and for baking along with me this week - glad you liked the torte! I think your torte (or whatever you want to call it) is very photogenic. Now I've seen a few and realize that mine looks different. Oh well, it still tasted good. I can't remember how I found TWD, but I think there are a few Canadians on there. How did you find it? Oh, and pumpkin pie is the best. Special, but in a good way. (My German-speaking students always said 'special' when they meant terrible and it makes me laugh). Ciao ! I really like your minis and would love a slice with some coffee ! It looks so yummy..I bet it tasted real good to! I can picture myself eating this with a big mug of coffee! i'm liking the minis too. What a tasty-looking torte! Thanks for sharing the pear love! 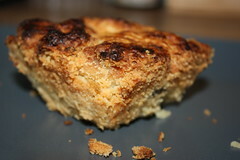 If you ever need some ins-pear-ation, visit our recipe pages at www.usapears.org. Glad that you liked this one! I subbed caramel and butterscotch for the walnuts and apricots. Yum!